The LeadsaiL portable mouse is equipped with memory function, every time you boot, it will turn to the default memory DPI value of 1600. To save energy, our optical mobile mouse will automatically shut off within 3 seconds/10 seconds/8 minutes of inactivity. If you want to wake it up, please click any button .Of course, you can press the ON/OFF button to turn it off or on. Sometimes you need to work on the computer while others want to have a rest. At that moment, a silent click mouse would help. Symmetrical and skin-friend design makes it more comfortable for your hands. For the highest pursuit of quality, we will do a good job in quality of inspection and sampling at the factory, so the mouse may have a slight wear at the bottom, that's normal and will not affect your operating experience ,thanks for your kindly understanding. 【Rechargeable Cordless Mouse】: Would like to practically eliminate the need to change batteries? 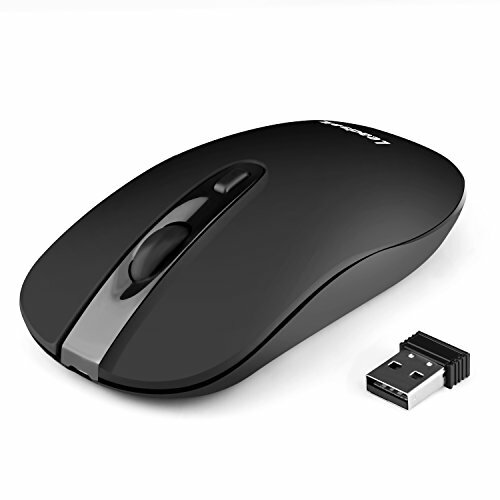 Buy this LeadsaiL rechargeable wireless mouse; plug it into your computer with the micro-USB charging cable and in 2hrs, it will be charged up and ready to power you through your entire day. A full charge lasts around 60 days. 【Silent Click Quiet Mouse】Would like to do your job without missing a sound or disturbing your environment? Choose LeadsaiL quiet mice; you can enjoy the same click feeling with over 90% less click noise. 【Plug and Play USB Wireless Mouse】Would like to forget about extra driver software? Plug and go ready, LeadsaiL USB wireless mouse works with Windows, Mac, Chrome OS or Linux-based computers of Notebook, PC, Laptop, Computer, Macbook. 【High Precision Optical Mouse】Would like to take full control of your every aim with perfect tracking? Choose LeadsaiL optical mouse. Featuring 5 adjustable DPI (2400/2000/1600/1200/800), the laser-grade engine ensures smooth cursor control and precision tracking on virtually any surface. If you have any questions about this product by LeadsaiL, contact us by completing and submitting the form below. If you are looking for a specif part number, please include it with your message.